The United States of America is one of the most technologically advanced countries in the world. This is evident from the fact that some of the leading technological brands, including Apple, Google, Amazon, and Netflix, have headquarters in the US, and have been dominating the tech world for quite a while. The United States of America is also a popular destination for tourists. With so many amazing cities to visit, tourists and expats alike travel to the country in millions every year. Being a popular tourist destination, the country is understandably filled with free Wi-Fi hotpots to provide maximum convenience to all web surfers. If you’re searching for free Wi-Fi locations in the US, the following guide will help you out! You’ll find thousands of public Wi-Fi networks in the US. These networks are extremely dangerous for any web surfer. It is important for you to understand how dangerous a public Wi-Fi network can be for your device and your private data. While it provides convenience, it can also compromise any private data that is stored on the connected device. Hacking Tools: There are dozens of tool kits available online that allow anyone to hack a Wi-Fi network within minutes. These kits guarantee access to any Wi-Fi network without the user even knowing that he has been hacked. Aspiring hackers are often found possessing such tools so they can practice compromising the Wi-Fi network of their choice. Replica Hotspots: Cyber criminals are coming up with new ways every day to breach any device of their liking. The easiest way to hack a Wi-Fi network is to create replica Wi-Fi networks with the exact same names. Your device will connect to that hotspot, without you ever knowing about the hotspot being compromised. Man-in-the-Middle Threat: MITM is another data snooping tactic used to monitor your online traffic. MITM allows hackers to monitor your data and see what you’re doing without you even knowing. Vulnerable Network: Wi-Fi routers come with standard encryption keys like WPA, WPA2 or WPA installed on them. These encryption keys shouldn’t be considered reliable because there have been many cases in the past where such protocols have been attacked and compromised with malware. KRACK Wi-Fi vulnerability is an example of how Wi-Fi security was breached through malware. Using free Wi-Fis can be convenient and fun. But we’ve all made mistakes while using an unknown Wi-Fi network at a coffee house or hotel. As explained above, hackers have been known to create replica Wi-Fi hotspots to exploit the vulnerabilities in your device. These hotspots can seriously disrupt the security of your data. This is why you should always make sure to consult with the staff, or the owner of the network, before joining the Wi-Fi hotspot. This needs to be applied to any hotspots available at cafés, airports, or any other place. Hackers have been known to use multiple tactics to hack devices. They are always searching for vulnerabilities in your network or device. The biggest vulnerability is the auto-sharing feature that can allows hackers to access your device with ease. You should disable the auto-sharing feature before connecting to a public hotspot. While Public Wi-Fis provide you maximum convenience, they are still more dangerous than you think. The dangers lurking on these networks outweigh the benefits they offer. We recommend that you avoid sharing any private and confidential data on these networks whenever you are connected. Joining public Wi-Fi networks is a risky business. Unless you have the right security tools with you, your device will always remain vulnerable on these networks. PureVPN is one such tool that can provide you the peace of mind that you need when using Wi-Fi networks. It enhances your web security and keeps you safe and anonymous, even while connected to a public Wi-Fi network. PureVPN provides access to special servers equipped with cutting-edge features that look after your online security. PureVPN provides military-grade encryption to ensure that even the most experienced hackers cannot monitor or hack into your traffic. There are also features like Wi-Fi security that double up your security whenever you connect to a public Wi-Fi network. Other than securing your web activities, PureVPN makes you anonymous on the web. It also provides access to any content available online. Now that you know the best practices to follow when connected to a Wi-Fi hotspot, the following are some places that you can visit in the USA to enjoy free internet connectivity. Apart from the wonderful sceneries, parks in the United States offer free access to the internet via public Wi-Fi hotspots hosted inside them. It’s America’s favorite place to get coffee. And it’s also known for providing free Wi-Fi to all its consumers. McDonalds provides you tasty meals in the form of juicy burgers. 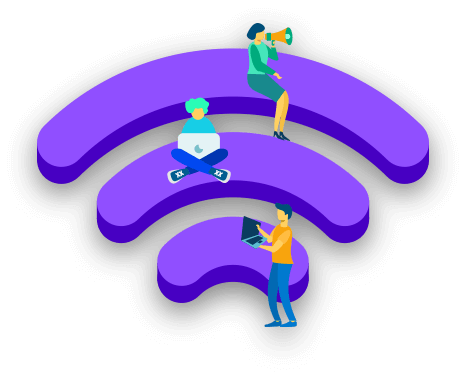 The franchises also offers free Wi-Fi to its patrons.You can find loads of Free Wi-Fis in the USA inside Hotels, Airport, Gym studios, Restaurants and even public parks.